What’s, errr, strange about this release is it came five years after The Doors’ eponymous debut was reissued on vinyl in its original mono mix. Why did they wait so long? Well, it could be that the band’s second album, Strange Days, wasn’t as big as their first—despite a couple of big hits. Chances are the record company couldn’t expect the kind of sales on this one that they did for the other, and yet, being what amounts to a definite “real fans only” release, you’d expect they could gauge demand well enough to know just how many they could sell and at what price. Maybe it took them five years to do that. 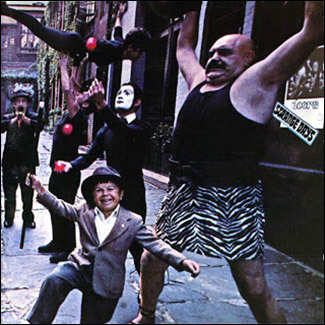 Strange Days arrived originally in September 1967, only nine months after The Doors first hit the scene as the band’s rookie release. Naturally, because LP numero uno was so big, great expectations were foisted onto numero dos. As usually is the case, creating an equally satisfying sophomore album is difficult. To their credit, The Doors did a pretty fine job. 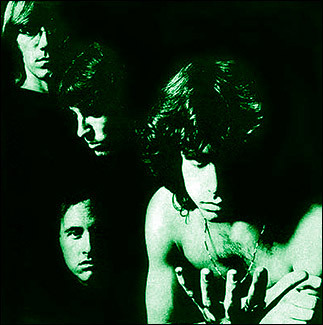 Strange Days is loaded with songs that could only be from Morrison/Krieger/Manzarek/Densmore, and has some of the band’s greatest songs on it, including the title track, “Love Me Two Times,” “People Are Strange” and the epic “When the Music’s Over.” There are also lesser known songs that are every bit as good as the more familiar ones, such as “Moonlight Drive” and ”You’re Lost Little Girl,” which I was first introduced to via Siouxsie and the Banshees’ cover (on their 1987 Through the Looking Glass album). 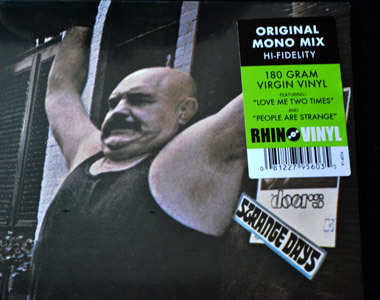 This Record Store Day 2015 issue of Strange Days is the first reissue of the mono mix of the album. Back in the ’60s mono and stereo versions of an LP were very commonplace, since hifi stereos weren’t yet in every home, but by the late ’60s stereo was winning and mono releases were gradually phased out. What that means is, finding a mono copy of this album today is difficult, if not darn near impossible, especially if money is an issue. So thank Rhino and The Doors for putting this out. Unfortunately, the mono mixes of these songs aren’t as good as the stereo ones. Take “Strange Days,” the album opener, for instance. Its mix is hampered by a pumping dynamic level that is pretty distracting. Yes, the mixes are slightly different (and the rest of them aren’t as problematic), and that’s why the dedicated fans will want a copy of this. But if you’re just a casual fan you can probably skip this one. I feel the mono mix of The Doors is a much more compelling listen—but then I like that album more. One thing’s for sure: Doors fans have been clambering for this reissue for sometime, collectively screaming “we want the world and we want it now!” Well, here it is! Grab one while it’s still grabbable.